The Most Accurate and Detailed Traveler's Map of Armenia! Over 1,000 locations depicted; with precise Latitude and Longitude coordinates on back. Major landscape features, including mountain peaks and ranges, elevations, river systems, and reservoirs. Points of interest, such as, nature preserves and parks, and select historical locations. Roads, classified to one of three conditions that can be expected. 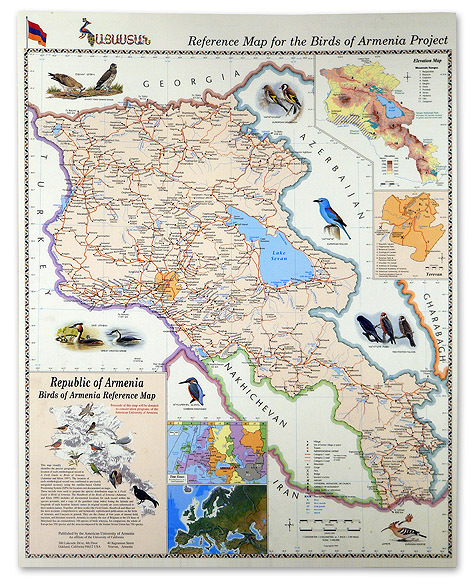 This map visually identifies the precise geographic location of each ornithological record in A Field Guide to Birds of Armenia and the Handbook of the Birds of Armenia.